Are you looking Govt. Job in Bihar State??? If yes, then here is good news for you. Bihar Vidhan Sabha Recruitment 2018 is issued for filling up 101 Assistant, Jr. Clerk & other vacancies. Those candidates are interested and eligible for given post may apply through online mode only. Applicants can submit their Bihar Vidhan Sabha Vacancy application form from 09.12.2018. An online written examination will conduct to select the candidates. The last date of submission Bihar Vidhan Sabha Online Form is 31.10.2018. Details of advertisement, eligibility & others you can collect from below section. Bihar Vidhan Sabha has published notification for inviting online application recruitment of 101 vacancies. There are Assistant Jr. Clerk, Librarian & other vacancies. Applicants can submit their Bihar Vidhan Sabha job form from 09.12.2018 to 31.10.2018. Furthermore, such as how to fill Bihar Vidhan Sabha Assistant Recruitment form? & others are mention below. Applicants must read full information and then click to apply for Bihar Vidhan Sabha Online Form 2018. How Much Fees Required For Bihar Vidhan Sabha Bharti 2018? Applicant those are going to fill Bihar Vidhan Sabha Online Form must ensure that they fulfill or not eligibility conditions. Through below education qualification and Age limit details to ensure that they are eligible or not. 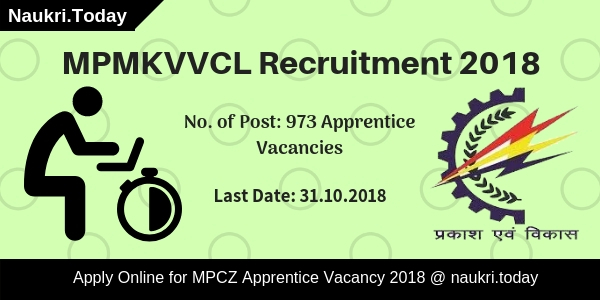 For you, we provide eligibility criteria of Bihar Vidhan Sabha Recruitment 2018. Those applicants are going to apply for Bihar Vidhan Sabha Jr. 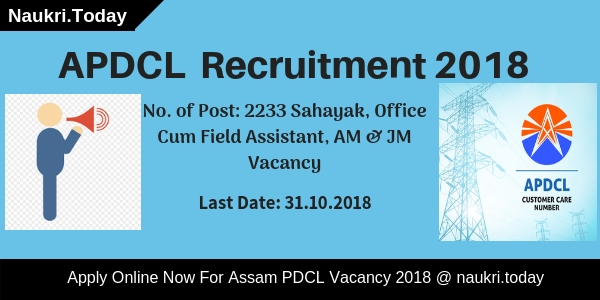 Clerk post must complete 12th class from recognized board. For vidhansabha.bih.nic.in Assistant Recruitment applicant must have a Graduate Degree from a recognized university. For other remaining vacancy, applicants must complete Graduation in relevant field from recognized university. More details refer to Bihar Vidhan Sabha Assistant Vacancy Notification 2018. As on 01.08.2018 those applicants going to fill the application form must complete minimum 21 years. The maximum age is divided into category wise according to relaxation. Check below section for maximum age required for Bihar Vidhan Sabha Recruitment 2018. For more information check Bihar Vidhan Sabha Assistant Recruitment notification 2018, which is mention below. Applicants selection will be made on the basis marks obtained in the Preliminary examination & Main examination. Those candidates want to participate in the Main examination must qualify the prelims exam. Final selection of candidates for Bihar Vidhan Sabha Recruitment will be made according to getting marks in the main examination. For more details check Bihar Vidhan Sabha Assistant Syllabus & official notification. For preliminary examination, those candidates are belonging to unreserved category have to pay Rs. 400/-. While Bihar Domicile candidates belonging to SC/ST/PWD (40%) need to pay Rs. 100/- towards application fees of Bihar Vidhan Sabha Vacancy 2018. Any other bank charges will bone by the applicant. Fees will pay through online mode using net banking/Credit card/Debit card. Applicants must take a hard copy of payment receipt. After selection of the applicant, they will also receive an attractive salary. They will get their salary as per pay scale level –2 and according to 07th Pay Commission. Other allowances will pay according to govt. norms. Candidates should check below section for detailed salary structure. Post wise salary structure of vidhansabha.bih.nic.in Recruitment 2018 is mention below. Those applicants are interested and also eligible for Bihar Vidhan Sabha Assistant Recruitment may apply through online only. You can follow some given below instruction to apply online. If you are going to fill application form of Bihar Vidhan Sabha Job 2018 then first you must have valid email id and mobile no. Applicants also has a scan copy of photograph and Signature. First of all, go to the official site vidhansabha.bih.nic.in. Download Notification of Bihar Vidhan Sabha Online Form. Click on the link Apply Online For vidhansabha.nic.in Vacancy. Enter your details like name, father’s name, address & other personal. Now fill your education qualification & other eligibility details. Upload Signature & photograph on your Bihar Vidhan Sabha Recruitment 2018. Make payment of application fees through online mode before 31.10.2018. Now recheck your Bihar Vidhan Sabha Assistant Job Application Form. Submit it and take hard copy for future uses. 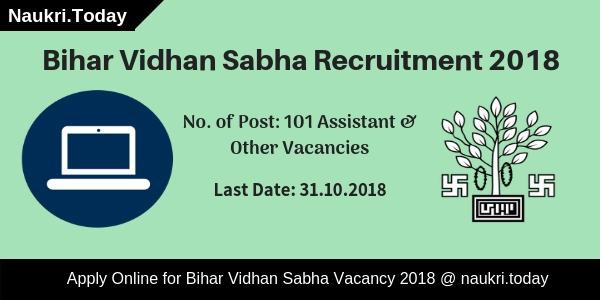 Conclusion: Bihar Vidhan Sabha Recruitment 2018 for 101 Assistant, Jr. Clerk, Librarian & other vacancies. Interested candidates who are also deserving apply online for vidhansabha.bih.nic.in Job may apply from 09.10.2018 to 31.10.2018. Then participate in prelims and main examination to select for the mention above vacancy.